HomeArchaeologyLost CivilizationsThe Legend of El Dorado: Was the Golden Empire of the Amazon Jungle Real? When Europeans first discovered the New World, there was one thing that fascinated them above all else – gold. There was gold everywhere. Natives adorned houses and clothes with the precious metal, frivolously using it as a beautiful substance to be moulded for ornamental use. For Europeans, gold – for all its beauty – had a far more practical purpose. Gold was the means to acquire land and title back in Europe. In their feverish pursuit of wealth, many Europeans encountered tales of a city filled with indescribable riches and gold. The stories described the city as imperial in size. It was said to lie in the jungles of South America, and was referred to as the empire of El Dorado. The empire of the golden man. 1Arciniegas, German. Plazas, Clemencia. Echeverri, Jaime. Secrets of El Dorado. 1991. 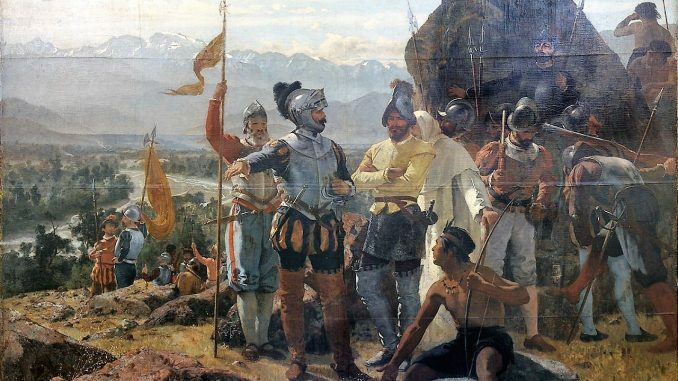 In 1638, Juan Rodríguez Freyle wrote to the governor of Guatavita, describing a peculiar story which was told to conquistadores by natives of South America. “[The king] spent some time secluded in a cave, without women, forbidden to eat salt, or to go out during daylight. The first journey he had to make was to go to the great lagoon of Guatavita, to make offerings and sacrifices to the demon which they worshipped as their god and lord. During the ceremony which took place at the lagoon, they made a raft of rushes, embellishing and decorating it with the most attractive things they had. […] At this time, they stripped the heir to his skin, and anointed him with a sticky earth on which they placed gold dust so that he was completely covered with this metal. They placed him on the raft […]and at his feet they placed a great heap of gold and emeralds for him to offer to his god. […] when the raft reached the centre of the lagoon, they raised a banner as a signal for silence. “The gilded Indian then [… threw] out all the pile of gold into the middle of the lake, and the chiefs who had accompanied him did the same on their own accounts. […] After this they lowered the flag, which had remained up during the whole time of offering, and, as the raft moved towards the shore, the shouting began again, with pipes, flutes and large teams of singers and dancers. With this ceremony the new ruler was received, and was recognised as lord and king.” 2Freyle, Juan Rodríguez. Conquista y descubrimiento del Nuevo Reino de Granada [El Carnero]. 1636. What was being described was in fact an old Muisca tradition, the Muisca being the native people of Colombia. Such initiation ceremonies did in fact happen, in bodies of water including lake Guatavita, lake Fúquene and lake Iguaque. 3Ocampo López, Javier. Grandes culturas indígenas de América. 2007. 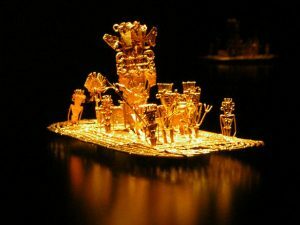 Such a tale of golden abundance was one of many which whetted the appetites of conquistadores searching for the fabled kingdom. And indeed, many Spanish explorers like Hernán Cortés and Fransisco Pizarro did discover unimaginable quantities of gold. 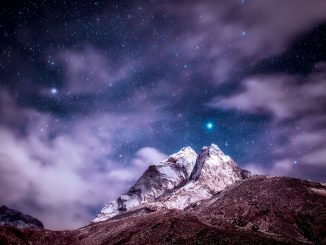 These instances served to fuel the search for El Dorado even more, with the New World being regarded as limitless in its potential for precious metals. The conquistadores Lázaro Fonte and Hernán Perez even went so far as to drain lake Guatavita in 1545, in the hope of finding some of the riches which had been so haphazardly disposed of by the natives in their ceremonies. 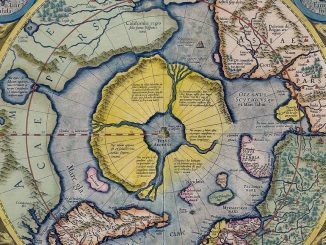 They found a modest amount of gold at great expense, resulting in many other gold-hungry explorers re-draining the same lake for centuries afterwards in search of gold. Lake draining became such a problem that in the present day, such activities have been made illegal by the government of Columbia. None of this, however, proved the existence of El Dorado. For that, deeper exploration was required. Has anyone found El Dorado? In the sixteenth century, Francisco de Orellana and Gonzalo Pizarro set off along the Amazon river in search of the fabled kingdom and its gold, as well as the “Land of Cinnamon”. What they initially found, however, was far from the riches they desired. Repeated attacks by fierce native people propelled Pizarro to retreat. Orellana continued. Against all the odds, he eventually made it to the Atlantic ocean, becoming the first to traverse the entire Amazon river. When he returned to Spain, he spoke of an advanced civilisation filled with riches amidst the Amazonian jungle. 4Mann, Charles. 1491: New Revelations of the Americas Before Columbus (Second ed.). 2011. p. 324. For much of history thereafter, people have generally assumed that Orellana had exaggerated his experiences in order to obtain more funding for another expedition to the Amazon. That his El Dorado could not exist in a jungle filled with bad soil and savage people. However, recent evidence suggests that Orellana may not have been wrong. 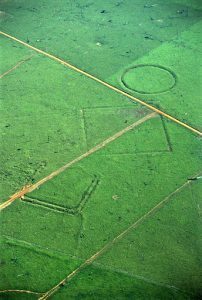 In 2011, the BBC documentary Unnatural Histories detailed how the deforestations that occurred in the Amazon jungle in 1970s uncovered large, man-made glyphs in the ground. Alongside this discovery was the uncovering of large amounts of terra preta, or black soil. Terra preta is a highly fertile, man-made soil, which infuses the normal, less fertile Amazonian soil with charcoal, bone and manure, in order to make it more productive. 5 Denevan, William M. Woods, William I. Discovery and awareness of anthropogenic amazonian dark earths (terra preta), 2007. This indicates that an advanced kingdom may have once populated the area of the Amazon. Some have even speculated that such a society may have propagated the largest rainforest in the world. Perhaps it was this thriving civilisation which instilled the native peoples of the Americas with stories of El Dorado to tell the Spaniards. The theory of El Dorado goes on to suggest that, since Spaniards tended to cohabit with their animals, including pigs, Orellana inadvertently spread virulent diseases as he travelled along the Amazon river. 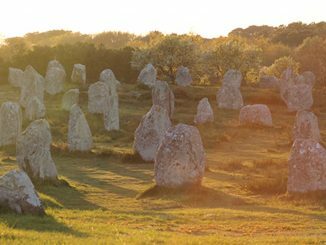 A civilisation that may have supported a population of nearly ten million, may have suffered millions of deaths. 6 Tollefson, Jeff. Amazon ecology: Footprints in the forest, 14 October 2013. Retrieved 08/02/2018 Whilst an unimaginably vast scale of destruction, the death of millions due to disease is not unreasonable, considering that researchers from the University of Berkeley have estimated that Hernán Cortés’ arrival in Mexico in 1518 diminished a population of 25 million to a mere 700,000 by 1623 – a 97% drop. 7Mann, Charles. 1491: New Revelations of the Americas Before Columbus (Second ed.). 2011. p. 324. Thus, it may be that El Dorado was once a very real city, but met its end at the hands of pestilence and disease.